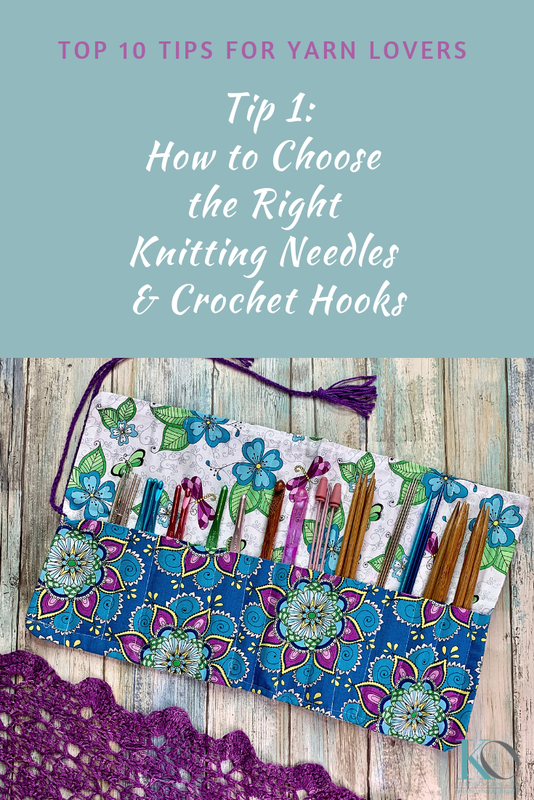 Do you like to use certain brands or types of hooks or needles with certain types of yarns? Are you aware that changing the material that your tools are made of can make a big difference in how you knit or crochet? When you make gauge swatches, or start working with new yarns, be sure to make a note of what TYPE or brand of tools you have used..
And if you are struggling with a stitch or yarn try changing your tools! When you begin working on a project make a copy of the pattern, and use that as your "work" copy. Make notes as you progress, and be sure to include the name of the yarn and hook or needle size you are using (including the brand or type).That way, if you put the project aside, and your project and paperwork get separated, you'll still be able to get them all back together! And be sure to mark off the rows as you work them - so much easier than trying to guess, remember or figure out where you left off! I use gallon sized baggies A LOT for organizing projects on the go. My favorite reason? Because I can make notes on the bags with Sharpies! This works well for holding squares/motifs/medallions that aren't going to be sewn together until the end. Or for holding sleeves, or other components to a project that will eventually need seaming. Weaving in ends is one of the most important parts of good finishing. Make sure your tails are at least 6" long before cutting yarn. I make sure to weave in multiple directions to ensure tails that stay hidden for a long time to come. I like to work in one direction for an inch or so, then turn and weave in the opposite direction for the next inch, and continue alternating until they are well hidden. While there are a few exceptions to the rule, I prefer to weave in loose ends on the wrong side of a fabric. And if you have a seam close by, even better. The bulk of a seam gives you a great place to hide tails. Making a gauge swatch? Be sure to use a tag to label the hook size, and stitch you used, along with the pattern information (if appropriate). Make note of the yarn, too. Keep all the swatches in plastic bags sorted by yarn type...next time you are getting ready to create a swatch, check and see what you have - it will give you a starting point! And speaking about gauge swatches - before you put them away, do some more with them...first of all, if you are making something that you are going to wear next to your skin, pin that swatch inside your blouse or skirt for a few hours, and make sure it feel nice. Also, be sure to launder the swatch as you will the actual garment, to test for any issues with the yarn, and see how it will look. Block, block, block! Yes, it really does make a difference! After you knit or crochet that gauge swatch, be sure to block it – it’s the only way to really know what size it is! Take your swatch and pin it to size onto a blocking board or towel; and gently “spritz” it with a little water. I like to add a few tablespoons of my Wrapture all-natural, no rinse wash to a spray bottle of water, and use that – it smells SO good! Let the swatch dry and re-measure. You can use the same technique when you have completed your project, or completely rinse in Wrapture. If you have a yarn stash (ok, who are we kidding? ), it's really important to keep it organized, so you can actually use what you have! How? Well, there are lots of ways, but regardless of the method, I think it's important to re- check and consider re-sorting your stash at least once a year. During that time you may learned new skills, changed your yarn taste, or forgotten to make notes about things you have added or used...updating your records yearly is a lot easier than you'd think. You can keep your records online in Ravelry, in an Excel Spreadsheet, in a database, or even just in a notebook. Keep track of the brand, type, and color of each yarn, as well as the yardage you have on hand. A kitchen scale that weighs grams is invaluable in calculating yardages of partial skeins. You can sort and store by yarn color, weight or type - or whatever system seems to make the most sense to you. I like to use clear plastic storage bins - they stack easily, are lightweight, and I can see what's inside. If I have yarn I set aside for a specific project, I place a copy of the project right in the bin with the yarn so I don't forget. When working on projects that require more than one skein of with hand dyed yarn, it’s important to recognize that there will be variations in color from one skein to the next. This can also be an issue if you are working on a project where the dye lots don’t match. In this case you need to alternate skeins for a subtle blending effect. It could be every row, every other row…it can be a varied pattern…but you don’t want to complete one entire ball of one color and go to the next – the key is alternating for a subtle effect. Breathe! Have fun!! This is yarn – you are supposed to enjoy what you are doing! Revel in the fact that this is a craft that has been enjoyed for thousands of years, in all different cultures! Share your work; share your love of yarn with others – I hope it will make you as happy as it makes me!